Every single day, nearly 47,000 people around the world, on average, are diagnosed with cancer. And while the disease can affect anyone, there is extreme disparity when it comes to cancer care and prevention globally. About 70 percent of all deaths from cancer occur in low- and middle-income countries. The reasons are myriad and complex; meanwhile, the human suffering is ubiquitous in these resource-limited settings. In Botswana, a democratic nation in southern Africa with a population of approximately 2.3 million, workforce capacity in the health sector is a major challenge to providing comprehensive cancer care. One example of many: there is only one medical oncologist in the country’s largest referral hospital. To say that this doctor is spread thin would be a gross understatement. Cancer patients at varying stages of illness, known and unknown, camp out in Botswana’s referral hospitals for days or weeks at a time, waiting to be seen. Waiting for test results. Waiting for consults. Waiting for a bed to open up. Waiting for medication. Waiting for surgery. Waiting, in some cases, to die a slow and painful death without any palliative care. Patients carry around their own medical records—paper charts, notes from other appointments, even x-ray films—in binders or plastic bags. Commonly, they arrive with only an initial cancer diagnosis from a tissue biopsy, but they haven’t had the follow-up exams needed to develop a treatment plan, or those procedures weren’t properly documented. 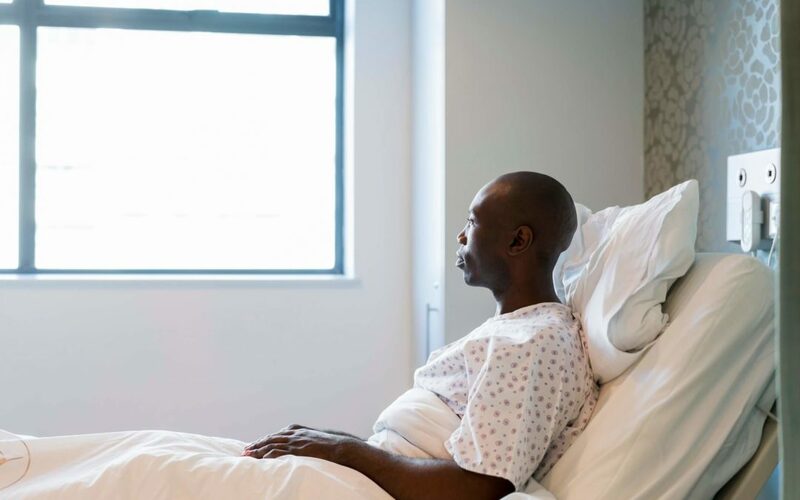 “People are dying from curable cancers in Botswana because of delays in each step of the cancer care process,” says Richard Marlink, an oncologist and the director of Rutgers Global Health Institute, based at Rutgers, The State University of New Jersey. Recently, the university announced the launch of the Botswana-Rutgers Knowledge Collaborative, a partnership with Botswana that has the potential to create transformational change throughout the country. Despite the skills, knowledge, and experience of the nation’s small-but-mighty health care workforce, the resources that are desperately needed—human, technical, logistical, pharmaceutical, financial, psychosocial—are in extremely short supply. In Botswana, they’re doing the best they can with what they have—but it’s not enough. Botswana and Rutgers are partnering to improve cancer care and prevention in material ways. Because a key challenge in Botswana is workforce capacity in the health sector, an early action item will be to train more clinicians to provide the specialized medical services that are needed in oncology and related fields, such as radiology, pathology, pharmacy, and nursing. Through the use of telementoring, the Botswana-Rutgers partnership will create a virtual extension of the health workforce and enable learning in both directions. Currently, if a hospital in Botswana only has one radiologist, it takes three to four weeks for a CT scan to be read, and patients needing more advanced imaging are sent to facilities in South Africa, which can take months to complete. “These barriers to care will essentially disappear,” Marlink says. “We can build and bridge the connections that exist within Botswana, within Rutgers, and with our partners around the world.” According to Marlink, clinical experts will be able to provide real-time input on cases from a distance, while also creating a knowledge bank to inform their future work and to help train others. Botswana native Tlotlo Ralefala, head of the oncology department at Princess Marina Hospital in Gaborone, the nation’s capital city, believes that a telementoring program focused on medical specialty training and knowledge exchange is a necessary step toward improving cancer care in Botswana. Providers in remote areas will have prompt access to advice from specialists, and patients will benefit from efficient referrals and effective care management, she says. While this telementoring program will be a cornerstone of the Botswana-Rutgers partnership—creating capability and reach that can swiftly affect many of Botswana’s health care needs—it is just one expression of the partners’ commitment to moving the nation forward. As Botswana President Mokgweetsi Eric Masisi and Rutgers President Robert Barchi announced on February 15, the Botswana-Rutgers Knowledge Collaborative will focus on health care, information technology, higher education research, entrepreneurship, civic leadership, and other needs to help Botswana transform its economy, which historically has been dependent on natural resources. In addition to cancer care and prevention initiatives, Rutgers Global Health Institute will contribute to the opening of Botswana’s Sir Ketumile Masire Teaching Hospital and has mobilized Rutgers’ School of Engineering to help create a biomedical engineering curriculum for undergraduates at University of Botswana. Rutgers, a state university with a global impact, is engaged in nearly 400 international partnerships. This partnership will benefit from Marlink’s deep relationships and experience in Botswana, originating in the 1990s, when he was a leader in setting up HIV/AIDS clinics throughout the country’s 34 district hospitals and more than 500 primary care clinics. At the time, Botswana had the highest prevalence of HIV in the world. The country’s national roll-out of a comprehensive treatment program for HIV/AIDS helped attract billions of dollars in international aid to Africa. This increased funding supported many developing countries’ efforts to control the rapidly escalating epidemic in the same way that Botswana did. Rutgers Global Health Institute and University of Botswana School of Medicine faculty members, physicians Tendani Gaolathe and Refeletswe Lebelonyane, are overseeing operations at the institute’s office in Botswana. Together with global oncology fellows Ashwin Chandar and Sukhdeep (Rita) Kaur, who are senior hematology/oncology fellows at Robert Wood Johnson Medical School and Rutgers Cancer Institute of New Jersey, the team already is working with partners in Botswana to support existing cancer control projects. The Rutgers fellows, for example, have helped create a patient referral protocol, audit chemotherapy drugs and pharmacy procedures, and review national guidelines for breast cancer care and prevention.